Dubai, UAE: European beauty brands will be a key feature this week at the Middle East’s largest trade fair for beauty products, hair, fragrances, and wellbeing in Dubai, as the lucrative regional market continues to draw in big names from the industry. France, Italy, and Spain are among the top ten exhibiting countries at Beautyworld Middle East 2018, with premium manufacturers looking to boost business in a Middle East and African (MEA) beauty and personal care market that was estimated to be worth US$32.7 billion in 2017. With 284 exhibitors, the three countries combined comprise 16 percent of the 1,736 exhibitors from 62 countries at the three-day showcase, which opens tomorrow (8 May) at the Dubai International Convention and Exhibition Centre. The robust presence is spearheaded by France (122 exhibitors), followed by Italy (102 exhibitors) and Spain (60 exhibitors), with all looking to flourish in a MEA beauty and personal care market that, according to analysts Euromonitor, will be worth US$47.5 billion by 2021. The Italian presence has traditionally always been a big attraction at Beautyworld Middle East, and this year returns with a full complement of exhibitors covering 2,000sqm of exhibition space. Industry heavyweights taking part this year include Alfaparf, Baralan, Ceriotti, Giorgio Janeke, Intercos Group, and Layla Cosmetics. Having been in the cosmetics manufacturing business since 1934, Layla Cosmetics now has a portfolio of more than 2,000 items, from make-up and nail polishes to general nail care and gel polish soak-offs. Tatiana Elleboro, Export Manager at Layla Cosmetics, said as a result of exhibiting at Beautyworld Middle East, the company has undertaken many business partnerships in the UAE, Iran, India, Iraq, Egypt, and even Europe. Antica Erboristeria is another Italian exhibitor eager to find regional distributors for its Herbatint range of natural permanent hair colours. Benoit Doithier, CEO of Antica Erboristeria, said Herbatint, which contains no ammonia, is the most natural alternative for permanent hair colour, enriched with eight organic herbal extracts. “Created in 1970 and currently sold in more than 40 countries worldwide, Herbatint is still today a reference thanks to the high quality standards of its formulation, offering a perfect long-lasting colour result in the gentlest possible manner,” said Doithier. Spanning more than 1,100sqm of exhibition space, Spanish participation has grown by more than 10 per cent year-on year at Beautyworld Middle East 2018. The world’s 8th largest exporter of perfumes and cosmetics will look to build its profile as a high quality international supplier in the Gulf Cooperation Council (GCC). According to Stanpa (Spanish Cosmetic, Toiletry and Perfumery Association), which supports the Spanish Pavilion at Beautyworld Middle East, Spain exported €240 million worth of beauty products in 2017 to the Middle East, a six percent increase over the previous year. The UAE was Spain’s biggest market, with €97 million worth of exports, followed by Saudi Arabia, to which Spain exported €40 million worth of cosmetics, skincare, haircare, and fragrances in 2017. Meanwhile, the ‘Made in France’ label continues to win over the world, with the UAE and Saudi Arabia among its key export markets. According to Business France, an economic development agency, French cosmetics exports reached €13.6 billion in 2017 globally, growing by 12 percent over the previous year. Exports to the Middle East also increased by 13 percent in 2017, according Business France. 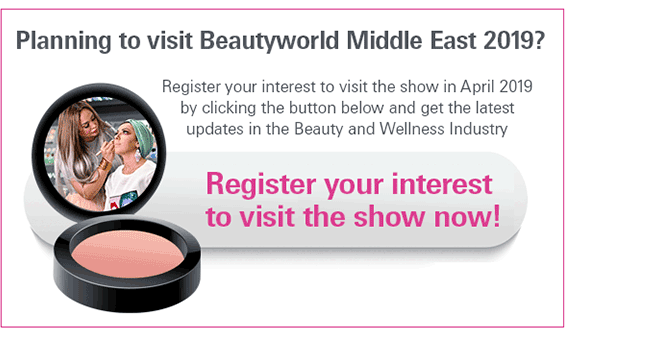 Now in its 23rd edition, Beautyworld Middle East features 24 country pavilions, including debut pavilions from Palestine, Peru, and Russia. Other pavilions are coming from Argentina, Brazil, China, Germany, Hong Kong, India, Japan, Korea, Morocco, Pakistan, Poland, Singapore, Taiwan, Thailand, Turkey, United Kingdom, United States, as well as pavilions from California and the GCC. Ahmed Pauwels, CEO of Beautyworld Middle East’s organiser, Messe Frankfurt Middle East, said: “Beautyworld Middle East attracts more than 40,000 trade buyers and beauty professionals from throughout the globe, confirming its pulling power as one of the world’s premier networking platforms for the beauty, hair, fragrances, and wellbeing industries. “While the international presence has always been a key feature, local support is also strong this year, with 198 UAE exhibitors covering 7,100sqm of exhibition space – a three per cent increase over 2017,” Pauwels added. Beautyworld Middle East is a magnet for retailers, distributors, and beauty professionals looking for the latest inspirations across the product groups of Hair, Nails & Salon Supplies, Cosmetics & Skincare, Machinery, Packaging, Raw Materials & Contract Manufacturing, Fragrance Compounds & Finished Fragrances, Personal Care & Hygiene, and for the first time in 2018, Natural and Organic. It also features key show highlights including Quintessence – the art of Perfume; Centre Stage by Nazih Group; Nail It! by Artistic Nail Design & OPI; and the Battle of the Barbers. New this year is the Innovation Zone, Blend it! in collaboration with centdegres, and the Advanced Aesthetic Therapist Conference and Workshop. Have you ever had problems with your web host? I'm open for recommendations as my webhost is dreadful right now.